In this painting, I decided to keep all the areas I had originally masked white, to make them stand out. But if you want, you can color in your white designs or draw patterns within the white areas. You’ll see some examples at the end of this tutorial of previous artwork I created using these techniques, except in those paintings, I chose to draw over the white areas with watercolor pencil. After the masking fluid dries (which won’t take long at all – just a minute or two! ), your next step is paint a wash of watercolor over the entire surface of your paper or board. Side note: For me, adding water is the really fun part. Rather than draw with watercolor pencils over the entire surface and then add water, I like to draw a bit with the watercolor pencils, then add water to what I just drew, then draw some more with the watercolor pencils, then add water to the new stuff I just drew – and so on until the artwork is finished. I just think it’s more fun that way! But if you prefer to draw all over with the watercolor pencils first and then add water as the very last step, go for it! To add water to the watercolor pencil marks:Dip your clean paintbrush in a container of clean water.Shake off and/or squeeze off any excess water.Put the brush directly on top of the areas you colored with watercolor pencil, and work the water into the color. 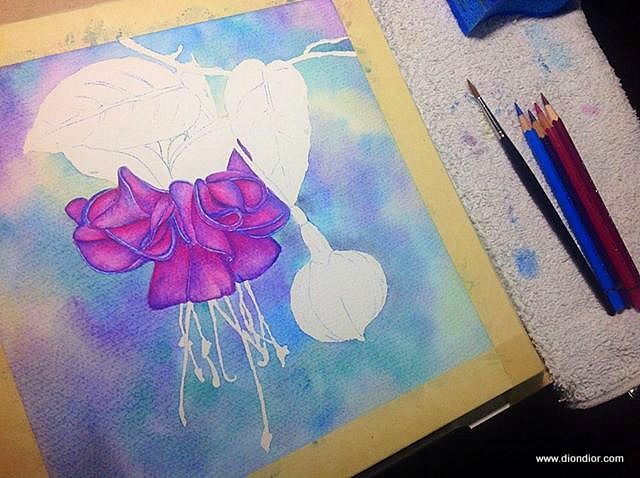 After the masking fluid has been totally removed, now it’s time to add colorful designs using your watercolor pencils! 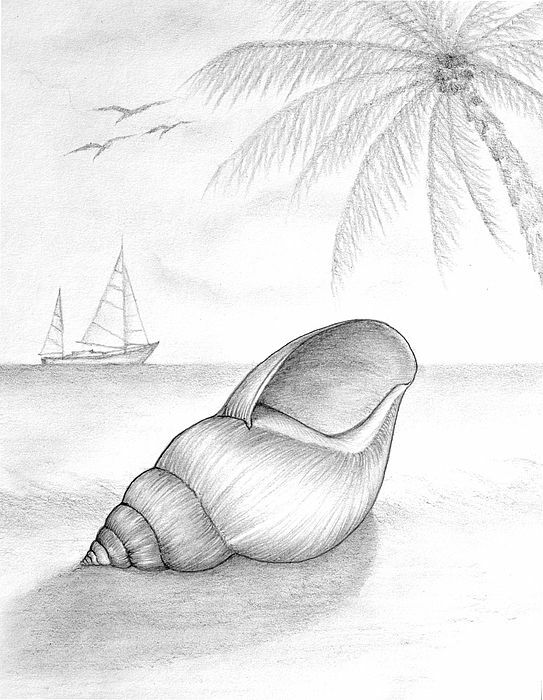 First sketch your composition in pencil, then layer in many colors in watercolor pencil. Aim for smooth transitions between colors, but don’t spend too much time on this stage — the water will blend everything later. 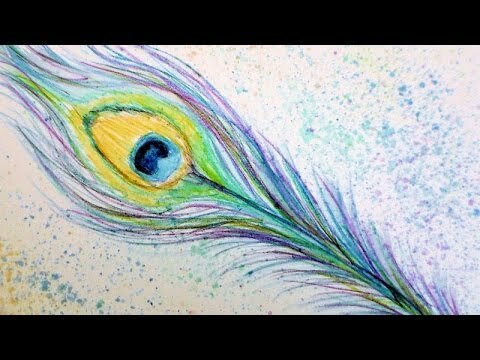 Let’s explore techniques you can try with watercolor pencils.Technique #1: Color your drawing, then brush over it with water. Rub the bristles over a bar of damp soap, working the soap into the bristles. Alternatively, you can add a drop of dishwashing liquid to a small cup of water, and dip the brush in that. Both techniques will help protect the brush against the quick-drying masking fluid. Then, without rinsing the brush, dip the brush into your masking fluid, and apply the masking fluid to your paper. Below you can see a close-up showing how a specific area (the blue triangles) look after adding water. In the set of blue triangles below, on the left are 2 triangles to which I’ve already added water. On the right are 5 triangles that haven’t been watered yet. It looks really different after water is added, doesn’t it? This is an 8 inch by 10 inch painting on hardboard panel – similar to Ampersand Aquabord, but without texture, so it was more smooth. The smoothness created more of a challenge to apply the watercolor pencils, because they didn’t adhere as smoothly as they did to the Aquabord. I also used black ink in this piece, this time to draw whimsical abstract designs inside the white circles that had been masked with masking fluid. Like in the previous 2 pieces, I added colored designs over the other masked abstract designs. Sometimes the paint “beads up” on top of the masking fluid, as in the example above, but that’s okay! Just let it be. You don’t need to try to wipe it off, because the masking fluid will resist the paint. First, you can draw a spot of color on your paper, using this as you would use a palette. Using paper as a palette gives you more control of the color intensity and allows you to mix hues easily. Just know that the colors will look different after water is added. You might want to make a chart on a piece of watercolor paper to see how the colors will look once wet, as the water will usually make the colors appear much darker and more vibrant. While all the examples above use just one color, you can absolutely use more than one. Try layering colors or placing colors beside each other. To avoid muddying the painting, it’s best to brush the lighter areas first and move on to darker colors later. 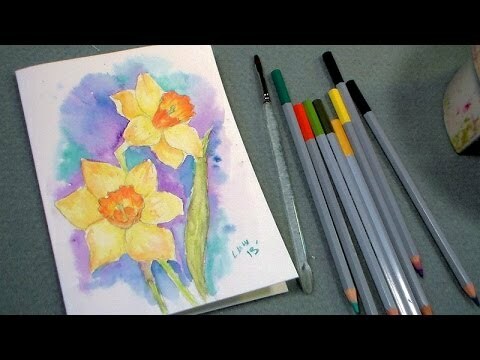 This was the first painting I did in this style, using the techniques demonstrated in this watercolor pencil art lesson. This is a 12 inch x16 inch painting on Ampersand Claybord Textured (now called Aquabord). In addition to using watercolor pencils and watercolors, I also used black ink to add whimsical wispy lines in the background. In this painting, I drew colored designs over the white areas that I had masked with the masking fluid, so it’s a bit harder to tell which areas had been masked. Materials Needed: Watercolor pencils – A set of 12 should be enough to get you going in this lesson. I have 2 sets of watercolor pencils – a set of 24 Prismacolor Watercolor Pencils and a set of 24 Staedtler Karat Watercolor Pencils, so I used colors from both sets in this tutorial. 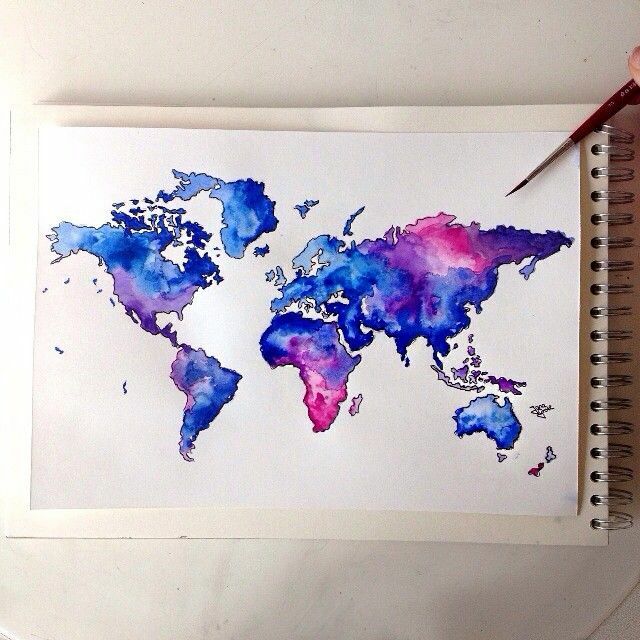 Watercolors – Any basic set of watercolors will do. For this tutorial I used a set by Sennelier (the Sennelier Watercolor Travel Set with 14 Half Pans. In the past I have used student watercolor sets by Loew-Cornell. You can use either pan watercolors or tube watercolors, whichever you prefer. Watercolor masking fluid – I used Winsor & Newton’s Colorless Art Masking Fluid. Painting surface – I used an 8 inch by 10 inch Ampersand Aquabord because it is a strong, sturdy surface that doesn’t require any preparation before use. Your painting surface can be any size you want and you can also use watercolor paper if you prefer. 2 small, round paintbrushes – For this painting, I used 2 small round watercolor paintbrushes: an old, inexpensive one for use with the masking fluid, and a newer nicer brush for painting both the bottom background layer and for wetting the watercolor pencil marks. When using watercolor masking fluid, you should always use an inexpensive brush, because if the fluid dries on your brush, the bristles can quickly get damaged beyond repair. Bar of soap – For clean-up and also to protect the bristles of the brush you’ll be dipping in the masking fluid (more on this in the tutorial). Another option is to lift the paint directly from the watercolor pencil with a wet brush. This is a 5 inch by 7 inch artwork on Ampersand Claybord Textured (now called Aquabord). It’s different than the other examples because I used the masking fluid to create images that are representative symbols, rather than purely abstract. While the masking fluid was still on, I carefully drew with watercolor pencils around the masked areas to create a soft patchwork background, with I then watered to spread the pigment. Then I drew more symbols over top using watercolor pencils. 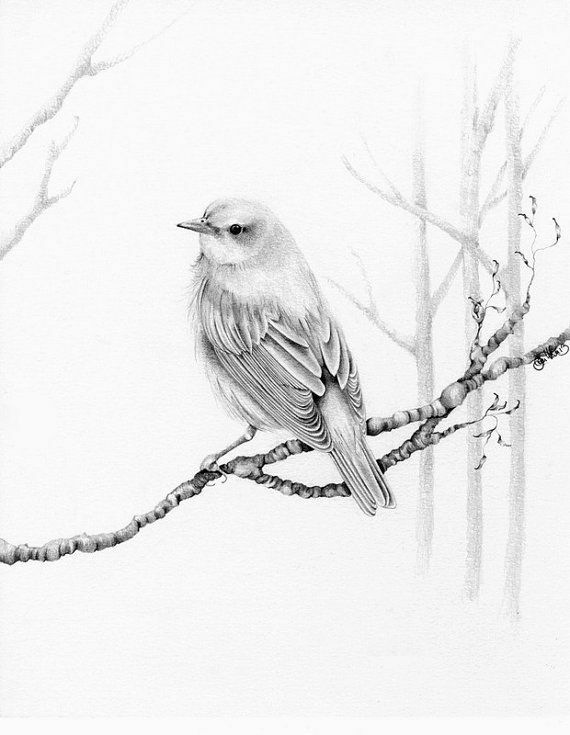 Technique #4: Use the pencils dry to add details on a watercolor painting. Once you’ve added a bit of color with your watercolor pencils, you can put your pencils down and add water to turn the pencil marks into paint! Don’t leave the masking fluid on too long – a week at most – because it gets harder to remove the longer you leave it on. You don’t have to water all the watercolor pencil areas if you don’t want to. For instance, you might like the grainy, textured look of the watercolor pencil. 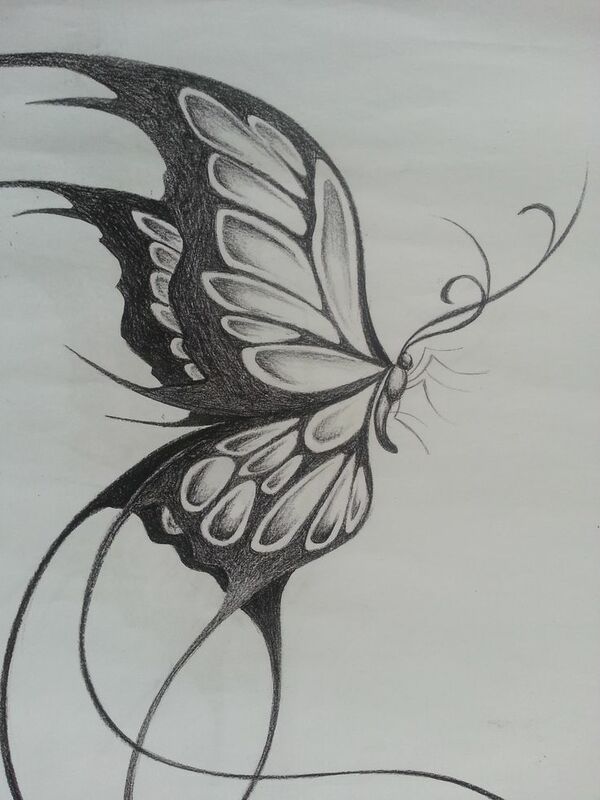 Maybe leaving a few designs as-is will add another dimension to your painting. It’s something to keep in mind as you work, anyway! Use a spray bottle filled with water to spray the paper. You want enough moisture that the pigments start to bleed, but not so much that the colors mix completely. Once the paint is totally dry, you can remove the masking fluid. You’ll want to be sure that any paint that has stayed on top of the masking fluid is dry too, otherwise it might smear when you try to remove the masking fluid. 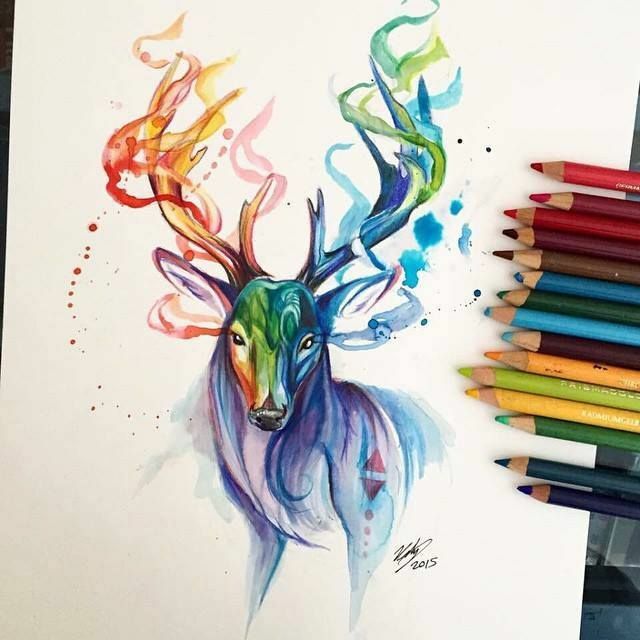 Watercolor pencils can also be used to add patterns to a painting, the same way you would use colored pencils. Related PostsBreaking the Law: Mixed Media Painting TechniquesWhat to Look for in a Brush Pen4 Common Watercolor Mistakes and How to Fix Them! Remember that this is just the background layer, and you’ll be adding a lot of color and more designs on top of this, so don’t worry about making your background “perfect”. The point is basically to get a layer of color down, and then build from there! The only difference between watercolor pencils and regular pencils is in the binder used to hold the pigments. There is usually some kind of wax or oil in colored pencils and some kind of water-soluble gum in watercolor pencils. 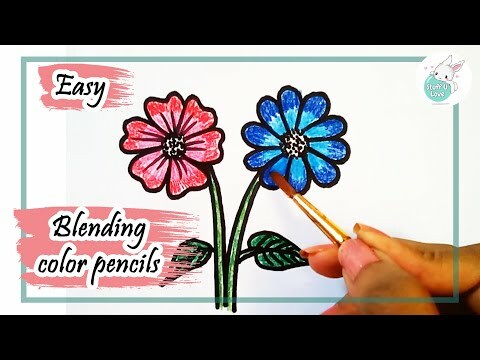 Check out this post on mixed media painting with watercolor pencils for a step-by-step tutorial on this technique. I ask that if you plan to publicly display or sell your paintings that you made based on this lesson, please give proper credit, such as “Title of artwork, based on a tutorial by Thaneeya McArdle” or “Title of artwork, inspired by the work of Thaneeya McArdle”. I thank you in advance! You can control the color intensity by modifying your coloring: A “looser” coloring will produce a lighter color, as you can see in the blue swatches in the image above. If you are trying to make a name for yourself in the art world then it’s very important that you develop your own style. The art world is smaller than you might think (thanks to the Internet) and trust me, people will notice if you copy another artist’s style without crediting them. Developing your own style is one of the most important things you can do for yourself if you seek an artistic career. 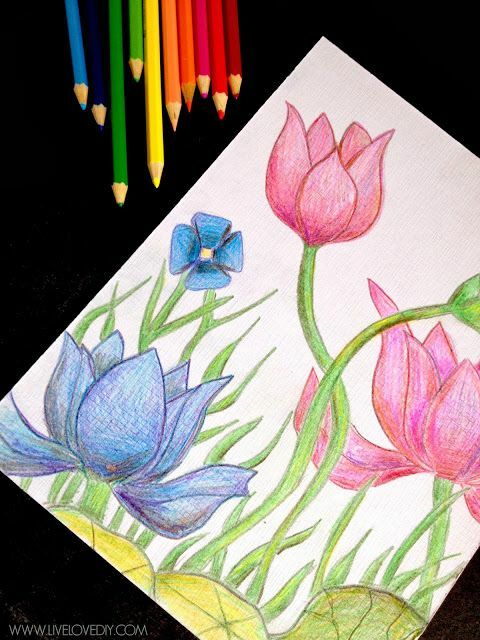 Watercolor pencils can be used on top of a watercolor painting to add designs and fine details. This is a great way to create very fine, controlled lines that match the watercolor aesthetic. To clean the paintbrush, hold it under running water and rub soap through the bristles until the bristles start to feel pliant and soft. If you still need to apply more masking fluid to your painting, rub soap into the bristles and leave it there (as described above). If you’re done with the brush, rinse out all the soap and let the brush dry. 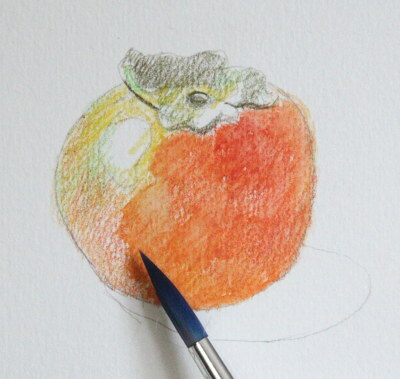 Even if you’ve never used watercolor pencils before, you’ll find that the techniques described here are easy to follow, providing you with a basis for further exploration and experimentation. Consider this a primer in how to use watercolor pencils! 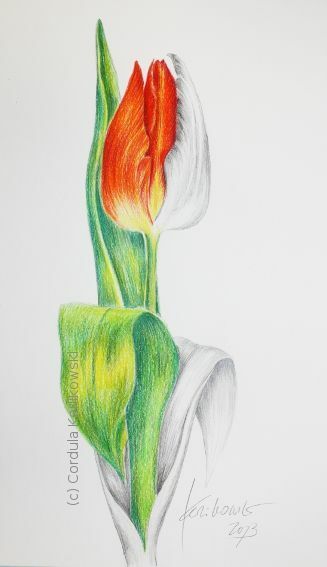 You can use the watercolor pencils dry or dip them in water before drawing to make a darker bolder line, like you see in the floral design on the right. Or, you could even try drawing with the pencils on wet paper, which will produce a soft line. These pencils present really exciting and unique opportunities to create complex, beautiful works of art. Here are a few ideas and techniques you can try with this exciting, versatile medium. Technique #2: Color your drawing, then spray over it with water. First – and this is very important! – masking fluid dries quickly. This means that once you put it on your paintbrush, you need to move quickly to put the fluid onto your paper or board, before it starts to dry on the bristles. If masking fluid does dry on the bristles, it can be very difficult (often impossible!) to remove – and if you do manage to remove the dried masking fluid, your brush may be a stiff, unusable shadow of its former self. This is why you should use an old brush or an inexpensive brush when using masking fluid. When I use masking fluid, I clean the brush as soon as the bristles start to feel stiff, even if I’m not done applying the masking fluid everywhere I want it. This means I usually clean the brush several times before I’ve finished applying the fluid. Selling the art you make from this tutorial is fine if you are a hobbyist and you created one or two pieces in this style. As long as you made the painting “your own” and didn’t copy my art directly, then I’m fine with that. But if you create several paintings based on this tutorial and you want to sell them, then you really need to think about how that will impact your art career. When you finish your piece and you’re completely sure you don’t want to add anything else to it, consider giving the artwork a coat of spray varnish. This will protect the painting from dirt, smudges, and UV rays – but most importantly, it will protect your painting if it happens to get wet again. Watercolor pencils can be used on-the-go as a substitute for watercolor pans or tubes. There are two ways to do it. This watercolor pencil art lesson shows you how I make colorful, whimsical abstract art in my signature style. I truly enjoy sharing my techniques so that others may also enjoy the process of making art, rather than keep my processes a “trade secret” like many artists do. I figure, if making art makes me happy, I’d love for it to make you happy too! Let everything dry. you’ll see an abstract, ghost version of your drawing. Add more definition to the composition using watercolor, colored pencils, ink pastels — whatever medium you like. Apply the details lightly so you can see the textures of the sprayed watercolor pencils. As I add more designs, I try to come up with new patterns. I also strive to balance the colors so that no single color dominates the composition. I’m basically trying to create a harmonious variety of shapes and colors that cause the viewer’s eyes to bounce around the painting. In this detailed step-by-step art lesson, you’ll be both drawing and painting – but don’t worry, it’s not hard at all! Because you’ll be creating an abstract, anything goes in terms of color choices, shapes and designs, and the placement of those designs (in art terms, this is referred to as “composition”). You’ll also learn how to use watercolor masking fluid. If you’ve never used masking fluid before, you’ll discover what a wonderful tool it can be to create special effects in your watercolor art. 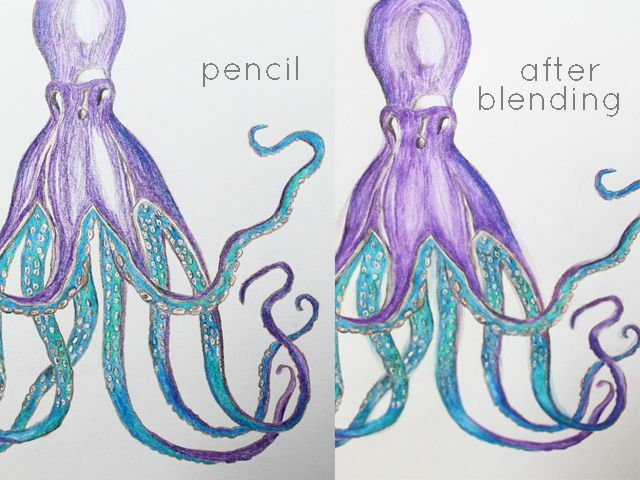 Watercolor pencils look the same as regular colored pencils, but when you start working with them, you quickly realize that they hold so much more potential. The magic happens when water is added, transforming the pencils and causing them to behave like watercolor paint. If an artwork containing watercolor paint or watercolor pencils gets wet, chances are it will smear or the colors could run. Watercolors and watercolor pencils aren’t truly “sealed” unless they’ve been coated with a spray varnish, so until then, they are very vulnerable. 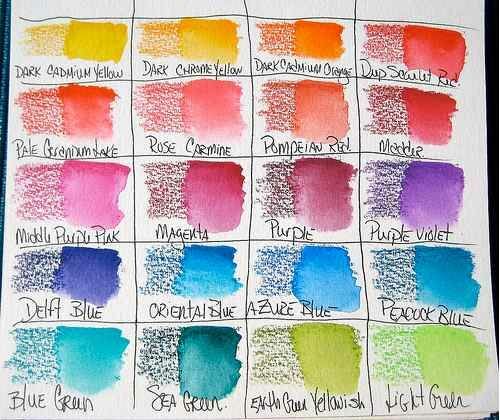 This is the most common way to paint with watercolor pencils. In this technique, you simply color areas of your work and then brush over them with plain water. 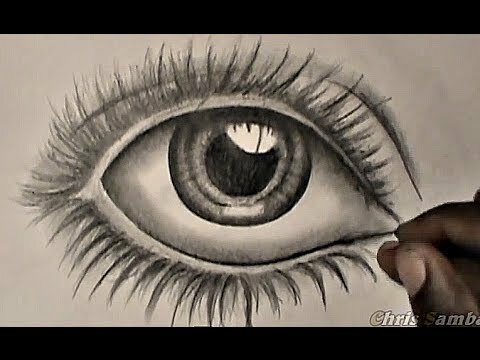 A variation on the brushing technique is to spray water instead of brushing it after your drawing is complete. Be sure to apply the masking fluid to dry paper. If your paper is wet or damp, the fluid won’t adhere properly. Tip: Be sure to rinse your brush in between colors, or else the pigment from one color will stick to the brush and transfer onto the other color. For example, after I applied water to the blue and green parts above, I rinsed my brush with clean water before wetting the orange and red parts. I didn’t want the blue or green pigment to muddy the orange and red parts.